Sicilian black bee (“Apis mellifera siciliana”) has a dark abdomen, yellow down and small wings. The black bee, which had existed in Sicily for thousands of years, began to disappear in the 1970s and 1980s when Sicilian beekeepers ceased using their cane hives and began to import bees from north Italy (most commonly, Apis mellifera ligustica, known as the Italian bee). At this time the black bee risked total extinction, which was avoided only through the work of Pietro Genduso. The last hive of pure black bees were found in a farm at Carini, just out of Palermo, where an old farmer had several beehive and was still making honey using the ancient method. When Davide decided to become a professional apiarist, he decided to take several beehives of black bees to the Aeolian Islands of Vulcano, Alicudi and Filicudi, off the north east coast of Sicily, where they could breed in isolation without the risk of contamination by other bees. Today, the honey produced by these bees is the only Sicilian honey produced entirely by the black bee. The Sicilian bee is docile and very productive, even in hot weather (it can withstand temperatures over 40°C, when other bees stop working) and can tolerate sudden temperature changes. 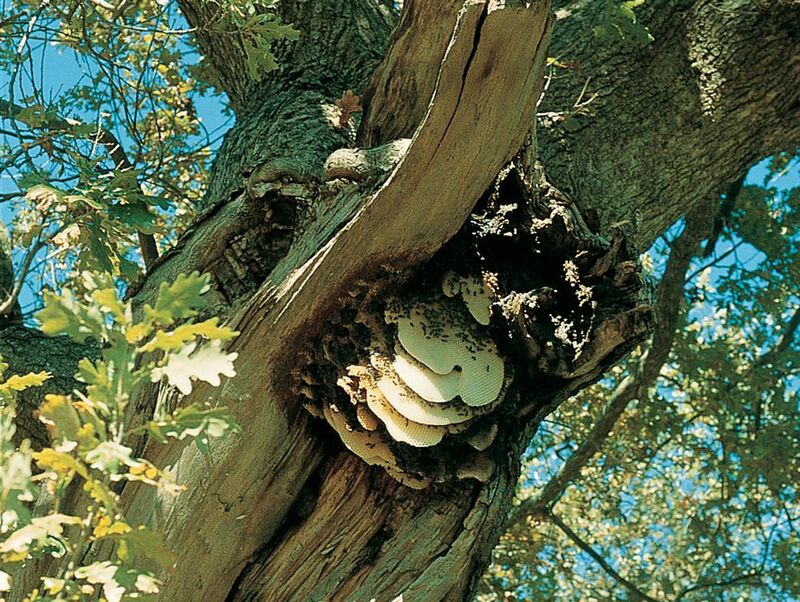 There are three main types of bee which occupy a beehive. At the “top of the tree” is the Queen. The queen is identified by her abdomen, which is significantly larger than any other bee in the beehive. Central to the beehive, the queen is supported by thousands of female workers – the “worker bee” and, in the summer, hundreds of male drones. The function of the drone bee is to compete for mating with the queen and only about 20 or so will succeed. Drones do no work and in the early autumn they are evicted by the workers and die.The black bee is distinguished from the common Apis mellifica ligustica (the Italian honey bee) not only by its colour but its smaller wings. It is so docile that beekeepers may not need to wear masks or suits when removing honey and tend the hives. The Sicilian bees are very productive, even at high temperatures (withstanding over 40°C) when other bees stop producing, and can tolerate sudden temperature variations. As a result it is an excellent pollinator for a wide range of plants. Honey is produced from April to July. Beekeepers used a primitive yet effective form of hive made from stems of the giant Fennel plant (Ferula thyrsifolia) in Sicilian, Fella. Iblei Mountain from flowers in the area of Hyblaean Mountains (Monti Iblei) between Ragusa and Siracusa. Takes the characteristics of the wildflower of the time of the year: In May for honey orange, in June for thistle, in August for thyme and eucalyptus, and in December producing carob). Province of Catania – Etna’s gold: the production and the different taste of Zafferana Etnea’s honey. On Etna slopes there’s the village called “Zafferana Etnea”, which has the largest of this food producers’ number of Italy. In the village there are more than 800 beekeepers. Not to be underestimated the production honey of cream in several flavours: hazelnut, pistachio nut, banana, strawberry, mixed berries. The honey production of Zafferana Etnea started since 1920 and is well-known all over the Italian territory, it is excellent for its healing properties and it is also used for the production of different typical desserts such as nougats, “mostaccioli” sweets, “zeppole” sweets. Excellent example of the use of the ancient ferula hive in Sicily. Beekeeper Sebastiano Pulvirenti, one of the last fasciddari (beekeepers) and standard-bearer of traditional beekeeping in the Hyblaean Mountains. In 1970 he had about 1500 hives of made of fennel stems (know as fasceddi), which gave about three kilograms of honey each. Today, he has only a hundred fasceddi in a shelter under rock in the heart of the natural reserve of Valle Anapo, near the old railway station, Pantalica.